While looking through my Veganomicon cookbook last week, I stumbled across a recipe for lemon bars. I've never tried one before but it sounded like the perfect summer dessert. I had all the ingredients already ( don't you just love when that happens ) so I just had to make it. I would describe it as having a shortbread crust, with a tangy lemon filling. Very yummy! They can be served at room temperature or chilled, although I prefer them chilled. 1. Pulse the flour, confectioners' sugar, and corn starch in a food processor. Add the margarine in spoonfuls and blend 8 to 10 seconds, and then pulse until the mixture resembles a coarse meal. 2. Sprinkle the mixture into the prepared baking pan and press firmly into an even layer with slightly raised sides, so that it can hold in the filling. 3. Refrigerate for about 30 minutes and preheat the oven to 350 F.
4. Bake the unfilled crust for 25 minutes, remove from oven, and let cool. 1. Mix the arrowroot into the lemon juice to dissolve. Set aside. 2. In a saucepan add the water and agar powder. Turn on the heat and bring the mixture to a boil. Boil for about 10 minutes, or until the agar is completely dissolved. 3. Add the granulated sugar and turmeric, and boil until they have dissolved, about 3 minutes. 4. Turn down the heat to medium and add the arrowroot mixture, then add the lemon zest and soy milk. Whisk constantly until the mixture thickens, about 5 minutes. It should not be rapidly boiling, but low bubbling is okay. 5. Pour the mixture into the prepared crust. Let cool for 20 minutes and then refrigerate for at least 3 hours, until the filling is only slightly jiggly and has set. Use a sifter or a fine-mesh strainer to sprinkle the bars with confectioners' sugar. Slice into squares and serve. these are so beautiful. i love veganomicon! great picture. they look marvelous, good job! starting next week, myself and two other vegan ladies are going to cook our way through the veganomicon. we are going to pick the same recipe and see how three different people make the same recipe. i hope you check it out! ooo sounds like fun! ill for sure be looking! yes try! they were very easy and fast to make! Yum, these are so pretty. 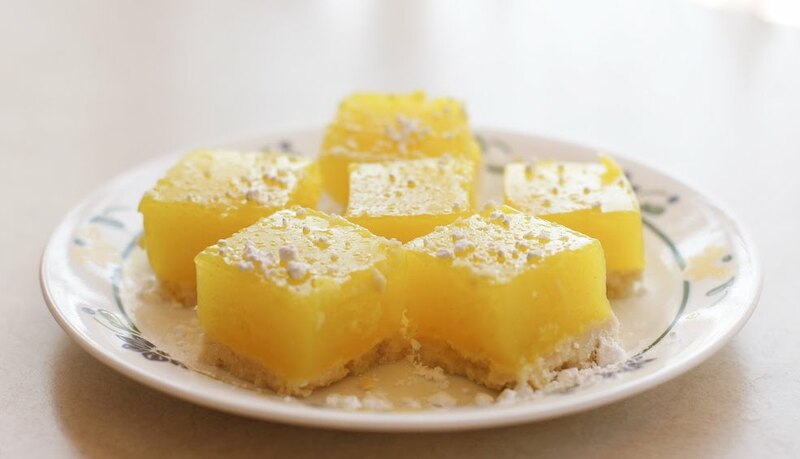 The photo makes them look like vegan lemon gelatin on short bread-nice!